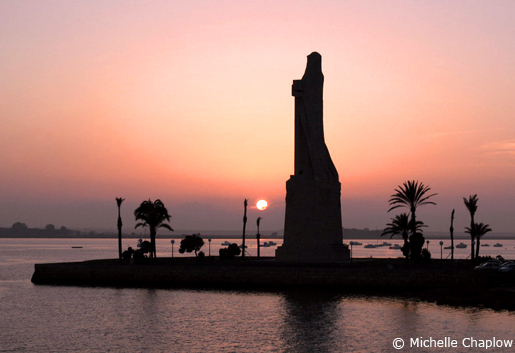 Huelva is a mecca for those interested in Christopher Columbus. Another pivotal point in the port's history was the industrial development in the city in the late 19th century due to mining activity to the north. Foreign mining companies built impressive ironwork loading quays that extended into the estuary that, although decaying, still exist today. The grand neo-Moorish train station, the Estación de Sevilla, was also erected around this time. Badly damaged in the 1755 Lisbon earthquake, Huelva lacks the architectural splendour of Seville. It does possess, however, several notable churches, like the oldest one in the city, the Iglesia de San Pedro, and the Catedral de la Merced, with a magnificent Baroque façade. The hub of the city centre today is the palm-lined square, the Plaza de las Monjas, close to the pedestrianized shopping district, along the streets of Concepción to Berdigón. The centre is relatively compact so you can see the sights without having to hop on a bus, although you may want to for the Sanctuario de la Cinta, located 3km out of town.